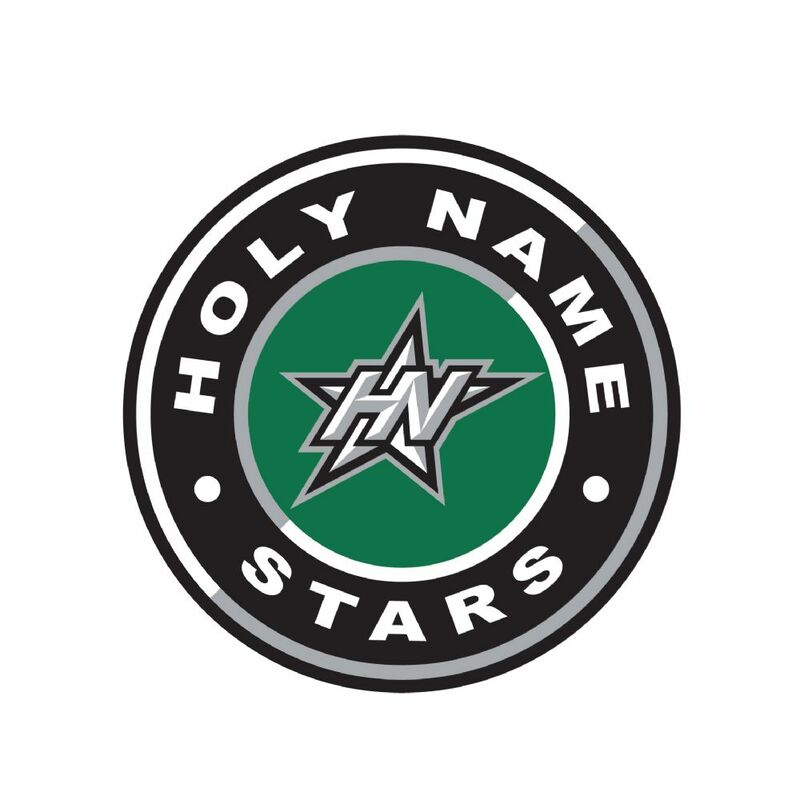 Holy Name Youth Hockey provides an environment where all players have the opportunity to develop a long-term passion and appreciation for ice hockey through individual skill development, teamwork, competitive play and camaraderie. While games are great fun, practice and core-hockey skill development are the keys to a hockey player's improvement and advancement in the game. Priority will be placed on improving our players' skills through multiple touches, effort and proper technique. We hope to accomplish this by emphasizing good coaching at every level, running efficient and fast-moving practices, and focusing on individual-skill development. Again, we want what is best for your children during the season, and this usually happens when they are appropriately challenged but also given frequent opportunities for on-ice success. As we approach the end of another hockey season, we would like to update you on a range of topics including, organizational changes, ice fees, and our evaluation registration and schedule for the 2019-2020 season. Since 1982 Holy Name Hockey remains a non-profit organization committed to providing hockey players of all abilities a place to develop. Like years passed, all players must participate in the evaluation process that will take place Monday March 18th– Friday March 22nd(full schedule and process below). The cost to evaluate is $100 for the first player in a family, $50 for the second player in a family, and free thereafter. Mini-Mites will not have to pay a registration fee. No player will be allowed to evaluate for the 2019-2020 season until all ice fees from the previous season(s) have been paid in full. If you previously skated with another GSL organization, you must receive a financial waiver from that organization before you can be placed on a Holy Name team. Given the changes that have taken place in youth sports, including hockey, over the past several years, our evaluation committee believes that Holy Name has an opportunity to make some changes that will enhance the hockey experience for its current and future players. We believe that our structure will provide an option for players to balance hockey with other sports and academic endeavors and challenge all our players across the organization. We will continue to place a heavy emphasis on development through practice and maintain the age appropriate practice to game balance. 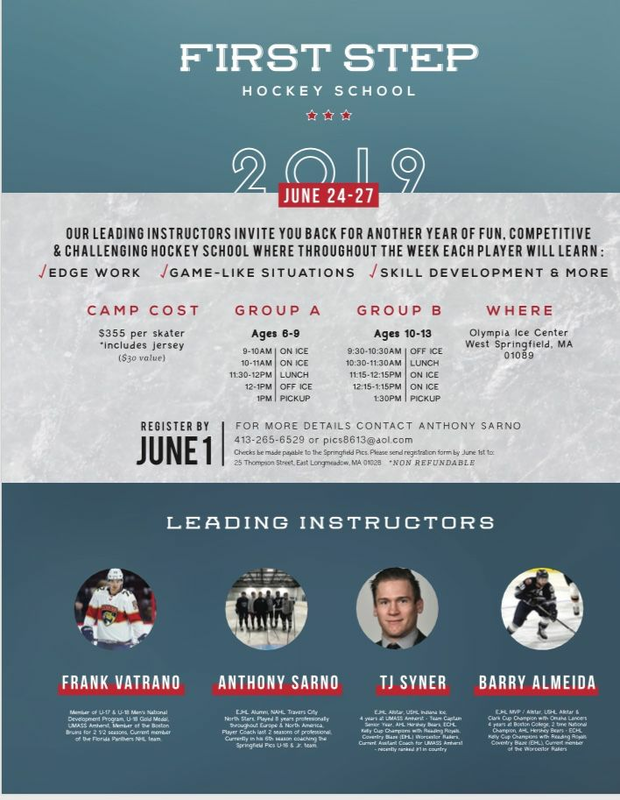 Below are the programs by age group, including the ice fee for the 2019-2020 season and evaluation schedule. After several years of flat ice fees, we implemented a modest increase to adjust for ice costs. Ice fees may be paid in full by June 1st or in 5 installments due June 1st, July 1st, August 1st, September 1st, October 1st. 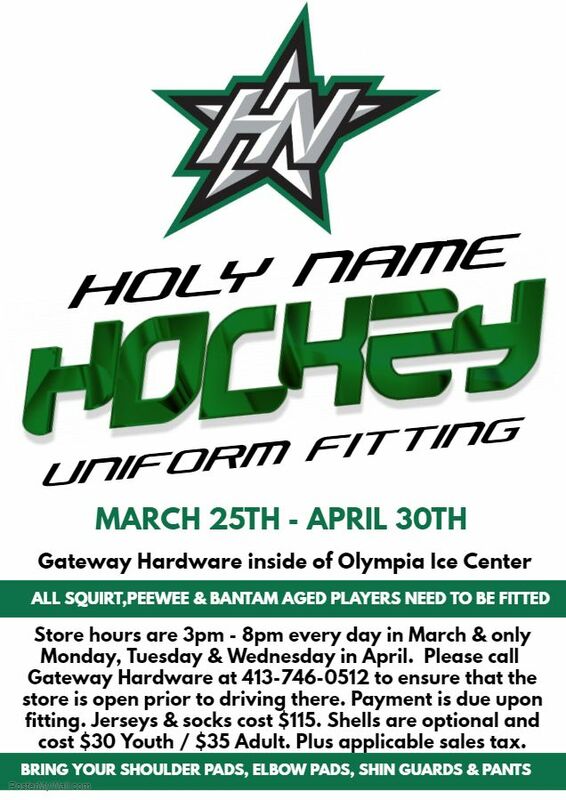 The Mini-Mites Program is the first step for Holy Name Hockey. Your son or daughter will now join a team, be issued uniforms, have a coach and play other teams from the Springfield area. Creating a positive, healthy environment for the youngest members of Holy Name is essential to a player’s long-term participation in ice hockey. The season will consist of approximately 40 hours of total ice time (including three jamborees). This will average out to approximately 2 hours of ice time per week. Through increased repetition, half ice hockey promotes the development of the most basic skills in the game. Please resist the temptation of switching to full ice hockey prematurely. In the latter part of the year, we will implement some full ice competition for final Mite year players. Learning off sides only takes a few practices. Don’t rush the process and allow your child the time to develop. Holy Name coaches and board members are available to discuss the Mite program. Our Squirt program will play an age appropriate game schedule, two practices per week, and a small area game practice every other Friday. We will be implementing two birth year teams next season at the Squirt level- a 2009 team and a 2010 team. The remaining teams will be a mix of players from both birth years, ranging from A to C level teams. As noted above, every player must participate in the evaluation process and every player will have a team to participate on. The 2009 team (second year Squirts) will play an independent game schedule rather than the Greater Springfield League (GSL). All other teams will participate in the GSL. One of the objectives with this change is to challenge all players. Our Pee Wee program will play an age appropriate game schedule, two practices per week, and a small area game practice every other Friday. We will be implementing two birth year teams next season at the Pee Wee level- a 2007 team and a 2008 team. The remaining teams will be a mix of players from both birth years, ranging from A to C level teams. As noted above, every player must participate in the evaluation process and every player will have a team to participate on. The 2007 team (second year Pee Wees) will play an independent game schedule rather than the Greater Springfield League (GSL). All other teams will participate in the GSL. One of the objectives with this change is to challenge all players. Our Bantam program will play an age appropriate game schedule and three practices per week. The teams will be a mix of players from both birth years, ranging from A to C level teams. As noted above, every player must participate in the evaluation process and every player will have a team to participate on. At the Bantam level, players should focus on the following skill progressions; 1. Knowledge (Rules, Concepts, Penalties, etc. ), 2. Goal Setting (written goals for each are of development), 3. Individual Skills (Skating, Puck Control, Passing and Receiving, Shooting, Checking), 4. Team Play (Offense and Defensive zone coverage and tactics, power play, face-offs, Pressure, Transition, support), 5. Nutrition (what does the body need, substance abuse), 6. Strength and Conditioning (improving athleticism, off-ice workouts), 7. Character Development (honesty, integrity on and off the ice, Selflessness, how to deal with adversity). Goalies are required to attend their age level games. Any player (Squirt, PeeWee and Bantam) desiring to play goalie must choose to play either “full time” or “part time” prior to the Evaluations. Any “part time” goalie should evaluate as a skater for the Skills Sessions, evaluate as a goalie during the Goaltenders Skills Session, and then evaluate as a skater for one Scrimmage Session and a goalie for the other Scrimmage Session. A “part time” goalie will be placed at the lower level depending on how s/he evaluates. Meaning, if s/he evaluates as an “A” goalie and a “B” skater, s/he will be placed on the “B” team. If a “full time” goalie has a “part time” goalie on his/her team, the “full time” goalie is guaranteed to play in 80% of the scheduled games. *Players will not play a set position on cross / half ice scrimmages; only on full ice. Coaches’ Evaluations:Every coach will be asked to submit a “hockey-ability” ranking of players on their team. A week of Evaluations can only give us a brief snapshot of a player’s all-around skill sets, so we use current coach feedback and incorporate the seven months’ worth of information our coaches have acquired teaching their players. These rankings will be used to assist the Evaluation Committee in making final team selections. Thank you and see you at the rink. Holy Name members get $25.00 off Tuition! A cutting-edge NHL analytics team puts the test to youth hockey for the first time ever. Watch this video and see what you think.